Moving to flagship headquarters has paid dividends for office technology companies [email protected] and The One Point, with increased turnover, an expanding customer base and new jobs. The partner companies are marking a year since moving to their new offices, The View, which occupies a prime position at the Bridgehead business park close to the Humber Bridge in East Yorkshire. The move cemented the strategic partnership between the businesses and provided them with a powerful platform for growth. Now, 12 months on, the investment has delivered on the ambition, with turnover growing by almost 30% across the two businesses from a combined client base of almost 1,400 organisations – an increase of nearly 15% over the past year. The growth has translated into new jobs, with 18 staff joining over the past year, taking the workforce employed by the sister companies to more than 90. New positions have included The One Point’s sales team doubling in size, while [email protected] has created a new, four-strong marketing team. The £2.75m offices were purpose-designed to enable the companies’ teams to work together seamlessly to offer a comprehensive and compelling package of IT managed services. Ken Sturdy, Managing Director of office technology business [email protected], said: “The investment in our purpose-built headquarters has been a powerful statement to our customers, our staff and the print and software industry as a whole. “As well as being a great place for our staff and customers to enjoy, it has provided a fantastic platform for us to improve even further our service to clients and explore and develop innovative new products and markets. The creative environment at The View has fostered increased innovation, with The One Point having launched a new service developing and delivering apps over the past year, including The One App, which enables clients to interact with the business instantly at any time. [email protected] and The One Point have both relaunched their websites in the past year and The One Point plans to introduce an online shop and customer self-service portal early in 2018. [email protected] has reshaped its Board and business planning processes to support the delivery of ambitious plans for further growth in 2018. Work is well advanced on creating a new [email protected] customer portal as a further avenue for client contact and the business is streamlining its remote monitoring software to deliver enhanced problem-solving and preventative maintenance. The companies are also working together to gain ISO 27001, the latest information data security accreditation, early in the new year. This will put the businesses at the forefront of managing and processing customer data, in line with the latest legislation. [email protected] and The One Point made a strategic decision to open up their new offices to clients and prospective customers, partner organisations, business groups and community representatives. Their ‘come and see’ invitation to visit and use the offices has resulted in more than 2,000 visitors over the past 12 months, with organisations such as the Institute of Directors and Humber Local Enterprise Partnership making use of the impressive facilities, as well as many community organisations. 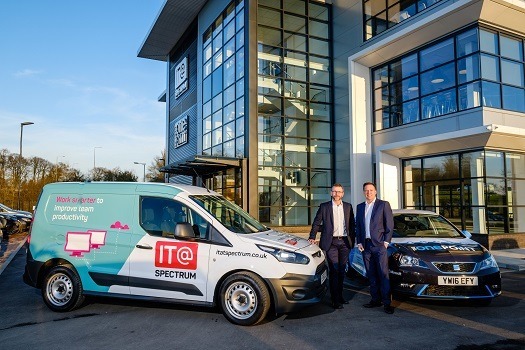 Martin Lauer, MD of IT services and telecoms company The One Point, said: “We’re proud that we’ve thrown open our doors and allowed so many organisations, from business groups to charities, to benefit from the space we have here.